I think it's about that time of year for an “Elf Yourself” post. Elf Yourself is a cute little holiday thing kindly made available by OfficeMax, where you upload a picture of yourself, mark where in the picture your face is, and then you see yourself as an elf doing a silly dance to some Christmas music. 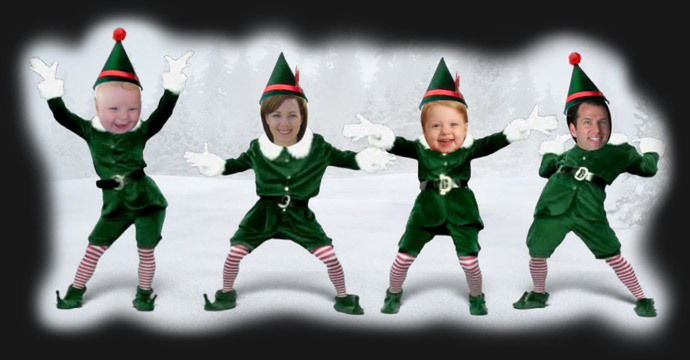 For example, here's a link to my brother and his family (pictured above) dancing like drunken elves. It's all quite silly, and it's really nice of OfficeMax to have made it. This year's is better than last year's in that if you actually read this screen, it's pretty clear that there's more to the text than you see at first glance (a sentence being cut off in the middle being one indication). Last year, it wasn't obvious at all that there was anything more than what you initially saw. 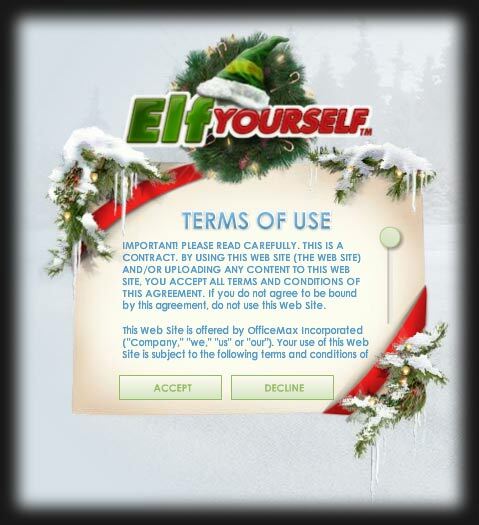 It might not sound like much, but hey, they're saying that you can Elf Yourself, which is the whole point. I'm not sure whether it's worth subjecting your face (and whatever else is in the photo you upload) to being the main feature in, say, a hemorrhoid commercial, but you have to allow for that because the contract does. It's also interesting that tucked into this contract is a sweeping liability release, such that if years later you happen to be strolling through an OfficeMax store and a safe falls from a shelf and hits you on the head, you're limited to at most $50 in compensation. Anyway, if you decide to read the whole contract, you'd best be comfy, because it'll take a long, long time. 20+ screens worth of lawyerly gobbledygook. For your convenience, I've reproduced it at right as one uninterrupted view (the making of which involved 45 screen captures, and an hour in Photoshop). I've also included it below. IMPORTANT! PLEASE READ CAREFULLY. THIS IS A CONTRACT. BY USING THIS WEB SITE (THE WEB SITE) AND/OR UPLOADING ANY CONTENT TO THIS WEB SITE, YOU ACCEPT ALL TERMS AND CONDITIONS OF THIS AGREEMENT. If you do not agree to be bound by this agreement, do not use this Web Site. This Web Site is offered by OfficeMax Incorporated (“Company,” “we,” “us” or “our”). Your use of this Web Site is subject to the following terms and conditions of use (the “Terms”). We reserve the right in our sole discretion to modify, alter or otherwise change these Terms and you agree to be bound by such modifications, alterations or changes. We will post changes here, so check back periodically. Your continued use of this Web Site after the posting of any change in the Terms shall constitute your acceptance to be bound by any such changes. WEB SITE CONTENT. Except for Submissions (defined below), this Web Site and all of the information it contains, or may in the future contain, such as photographs, graphics, artwork, illustrations, digital still images and advertising copy, as well as the trademarks, logos, domain names, trade names, service marks and any and all copyrightable material (including source and object code) and/or any other form of intellectual property on the Web Site (collectively, the “Web Site Content”) is, between you and Company, owned by Company and is protected from unauthorized use, copying and dissemination by copyright, trademark, publicity and other laws and by international treaties. Other than as explicitly set forth in the immediately preceding paragraph, nothing contained in these Terms or on the Web Site or in any communication from the Web Site or Company should or will be construed as granting, by implication, estoppel or otherwise, any license or right to use any Web Site Content in any manner without the prior written consent of Company or such third party that may own the Web Site Content displayed on the Web Site. ANY UNAUTHORIZED USE OF ANY OF THE WEB SITE CONTENT IS STRICTLY PROHIBITED. GRANT OF RIGHTS. By submitting a photograph or any other materials or information to the Web Site (including, without limitation, your name, picture, likeness, voice or biographical information, vocal messages, text messages or text) (each a “Submission”), you hereby grant to Company, its subsidiaries and affiliated companies and each of their respective licensees, successors and assigns (collectively, the “OfficeMax Entities”), the unlimited, worldwide, irrevocable, perpetual and royalty-free right and license to use, host, cache, store, copy, distribute, display, perform, publish, broadcast, transmit, modify, reformat, translate or otherwise exploit in any manner whatsoever your Submission throughout the universe, in perpetuity, in any manner or venue and for any purpose whatsoever, including, without limitation, for purposes of advertising, promotion or trade in promoting and publicizing Company and its products and services, by means of any and all media and devices whether now known or hereafter devised, which includes, without limitation, the unlimited right and permission to post the Submission on this Web Site. The OfficeMax Entities shall have the right, in their sole discretion, to edit, composite, morph, scan, duplicate, or alter your Submission in any manner for any purpose which the OfficeMax Entities deem necessary or desirable (each, a Modification), and you irrevocably waive any moral rights you may have in your Submission even if a Modification is not acceptable to you. You agree that you have no right of approval, no claim to compensation, and no claim (including, without limitation, claims based upon invasion of privacy, defamation or right of publicity) arising out of any use or Modification of your Submission, including, without limitation, any blurring, alteration, editing, morphing, distortion, illusionary effect, faulty reproduction, fictionalization or use in any composite form. SUBMISSIONS RESTRICTIONS. Your Submissions must not contain obscene, violent or offensive or otherwise inappropriate content (as determined in Companys [ sic ] sole discretion) nor show any person engaging in illegal activity. You will only submit photos that you have filmed yourself, or if the photos are not filmed by you, the person that has filmed such photos has granted to you all necessary rights to submit such photos. Your Submission must not contain any visible logos, drawings, cartoons, photographs, pictures, phrases or trademarks that belong to a third party or other third party materials. You may not submit music unless it is your original creation and you are the only singer. You agree that your Submissions will be considered non-confidential and non-proprietary and will not be returned to you. REPRESENTATIONS AND WARRANTIES/INDEMNIFICATION. You represent and warrant to the OfficeMax Entities as follows: (i) you have all necessary rights and licenses to enter into these Terms and grant the OfficeMax Entities all of the rights and licenses in these Terms; (ii) if you are not the only individual that appears in your Submission or whose voice is heard in your Submission, you have secured all rights from all other persons appearing or heard in your Submission necessary to enter into these Terms and grant the OfficeMax Entities all of the rights and licenses in these Terms; (iii) your Submission is previously unpublished and unproduced; (iv) neither your Submission, nor the use of your Submissions by the OfficeMax Entities will infringe upon or violate the rights of any other person or entity (including, without limitation intellectual property, privacy or publicity rights) or any applicable local, state, federal or international law, rule or regulation. Upon request of the OfficeMax Entities, you agree that you will provide the OfficeMax Entities any documentation, substantiation or releases necessary to verify my compliance with these Terms. You also agree to indemnify, defend and hold the OfficeMax Entities harmless from and against any and all actual or alleged third party claims, demands, causes of action, proceedings, judgments, damages, losses, liabilities, costs and expenses (including reasonable attorneys' fees and court costs) relating to or arising out of: (i) your breach of these Terms; (ii) your violation of any local, state, federal or international law, rule or regulation; (iii) your use of the Web Sites; or (iv) your Submission. The OfficeMax Entities reserve the right, at their own expense, to assume the exclusive defense and control of any matter otherwise subject to indemnification by you, and you will not, in any event, settle any matter without the written consent of Company. NO OBLIGATION TO USE, POST OR MONITOR. The OfficeMax Entities have no obligation to use your Submission or make it available for viewing and the OfficeMax Entities may at any time abandon the use or availability of your Submission for any reason. Also, the OfficeMax Entities may not (and have no obligation to) review or monitor your Submission prior to, during or after its use. DISCLAIMERS. THIS WEB SITE, THE WEB SITE CONTENT AND THE SUBMISSIONS ARE MADE AVAILABLE ON AN “AS IS,” “AS AVAILABLE” AND “WITH ALL FAULTS” BASIS. THE OFFICEMAX ENTITIES SPECIFICALLY DISCLAIM ALL WARRANTIES, EXPRESS OR IMPLIED, INCLUDING, WITHOUT LIMITATION, THE WARRANTIES OF MERCHANTABILITY, QUALITY, FITNESS FOR A PARTICULAR PURPOSE AND NON-INFRINGEMENT, WITH RESPECT TO THIS WEB SITE, THE WEB SITE CONTENT AND THE SUBMISSIONS. You should also be aware that any submissions made over the Internet may not be secure, and you should consider this before providing a Submission to us. The OfficeMax Entities make no representation or warranty whatsoever regarding the suitability, functionality, performance, availability or operation of this Web Site. This Web Site may be temporarily unavailable due to maintenance or malfunction of computer equipment or applicable networks. LIMITATIONS ON LIABILITY. You agree that: (1) any and all disputes, claims, or causes of action arising out of or connected with your Submission or use of this Web Site shall be resolved individually, without resort to any form of class action; (2) under no circumstances will the OfficeMax Entities be liable to you for damages of any kind, whether based in tort, contract, strict liability or otherwise, including, without limitation, any direct, indirect, special, punitive, incidental or consequential damages and/or any other damages (including, without limitation, for death or personal injury, damages related to rights of publicity or privacy or a claim that you have been defamed or portrayed in a false light), even if the OfficeMax Entities have been advised of the possibility of such damages, whether caused in whole or in part by negligence, acts of god, telecommunications failure, or theft or destruction of, or unauthorized access to, this Web Site or its related information or programs. The OfficeMax Entities assume no responsibility for: (i) damage to your computer system, phone line, hardware, software, network, network connection or programs; or (ii) other errors or failures related to your use of the Web Site or your Submission, including, without limitation, delayed computer transmissions or network connections, the incorrect or inaccurate capture of information or the failure to capture any information. NOTWITHSTANDING ANY OTHER PROVISION IN THESE TERMS, IN NO EVENT AND UNDER NO CIRCUMSTANCES WILL THE OFFICEMAX ENTITIES BE LIABLE TO YOU FOR ANY REASON OR ANY CAUSE OF ACTION WHATSOEVER IN AN AMOUNT GREATER THAN FIFTY DOLLARS ($50). SOME JURISDICTIONS DO NOT ALLOW THE LIMITATION OR EXCLUSION OF CERTAIN WARRANTIES AND CONDITIONS, OR THE DISCLAIMER OF SOME TYPES OF DAMAGES, SO SOME OF THE ABOVE MAY NOT APPLY TO YOU. I AGREE THAT I HAVE READ AND UNDERSTAND ALL THIS INFORMATION. Gosh, I am almost afraid to view you site after all that. Especially since they can determine what is offensive and no one else has dispute rights, throughout the Universe yet. I knew there was a reason why I go to Staples instead of OfficeMax. Merry Christmas, Happy New Year, and any other holiday, observance, ritual day, and other day you may hold dear, without liability, cost, other penalty [even if a safe were to fall on your head] resulting from observing any of these important or non-important days. Have a Holly, Jolly Christmas, etc. By accepting this agreement, you grant me permission to clean out your bank accounts, photograph you naked, or take possession of your cats (if any), for a period of one year. It would be amusing to find whether anyone actually noticed. Also, since this is the first I’ve written in reply to your journal, thanks for sharing your experiences. I’ve found the messages I’ve read in it quite informative. My my my, thank you for featuring my lovely family on your blog…I guess. I have wasted far too much time in my career reading the fine print on meaningless license agreements such as this to care any further what they contain. Sadly, they likely exist because idiots (remember there are lots of them out there, and their votes count just as much as yours!) will sue them because somebody gets offended, uses copyrighted photos or some other means of extortion legal in the USA. I’m kind of impressed that Officemax even does such a thing in this age of liability. If it means that their staff lawyers have to work all year long to craft a clickable agreement that only they (and you) read, then fantastic. Wow. I wonder if it is just me that feels this way or not, but i suddenly am nervous that I have never read the lisence agreement on anything i have on my computer.